Israeli forces say they have fired warning shots into Syria after a mortar round fired from Syria hit an Israeli post in the Golan Heights. It is the first time that Israel has fired on Syrian forces since the Middle East war of 1973. The latest incident comes days after Israeli troops were put on high alert after a vehicle was hit by Syrian fire in the Israeli-occupied Golan Heights. The two countries are formally at war and a UN force patrols the buffer zone. The Israel Defence Forces have filed a complaint through the UN forces operating in the area, stating that fire emanating from Syria into Israel will not be tolerated and "shall be responded to with severity". Defence Minister Ehud Barak said that "additional shelling into Israel from Syria will elicit a tougher response, exacting a higher price from Syria". In a statement posted on its website on Saturday, the IDF said the "mortar shell hit an IDF post in the Golan Heights adjacent to the Israel-Syria border, as part of the internal conflict inside Syria". 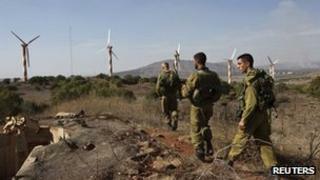 No damage or injuries were reported, but in response, "IDF soldiers fired warning shots towards Syrian areas". Last week the Israeli army said three Syrian tanks had entered the demilitarised buffer zone in the area to tackle rebel fighters. Israel complained to the UN peacekeeping force and military chief of staff Benny Gantz visited the Golan, warning troops to be on high alert and to prevent the conflict in Syria from crossing the border. In a separate development, three people were killed and five others wounded during sectarian clashes in southern Lebanon. Tensions in Lebanon have been stoked by the Syrian crisis as well as the killing of a leading intelligence figure and critic of President Bashar al-Assad. Fighting broke out in the port city of Sidon between members of the Shia militant group, Hezbollah and followers of Salafist cleric Sheikh Ahmad Assir. The cleric had reportedly criticised Hezbollah's support for President Assad and had called on supporters to tear down all posters of the movement's leader Sheikh Hassan Nasrallah in Sidon. Meanwhile, Syrian opposition groups meeting in Qatar have agreed to form a new coalition to oppose President Assad's government. The fractious opposition has been under pressure from the US and other backers in the region to clinch a deal and has been meeting in Qatar for the past week. Activists in Syria have reported recent Syrian troop movements close to the Golan Heights ceasefire line, a development very similar to what happened close to the Turkish border, BBC Beirut correspondent Jim Muir says. When five of its citizens were killed by Syrian shellfire, Turkey fired back in a limited manner. It is quite clear the Israelis will respond carefully and not let matters get out of hand, our correspondent adds. Israel seized the Golan Heights from Syria in the closing stages of the 1967 Six-Day War and thwarted a Syrian attempt to retake the area in 1973. Both countries signed an armistice in 1974 and a UN observer force has been in place on the ceasefire line since 1974. Israel's unilateral annexing of the Golan Heights in 1981 was not recognised internationally.